The Jade Phoenix Trilogy was an odd series of Battletech novels that focus on the triumphant rise of Aidan Pryde who died as a hero for Clan Jade Falcon despite his rather complicated journey to becoming a warrior. The key aspect of that story was how he had to masquerade as a freeborn warrior after circumstances had conspired against his perceived destiny with the clans. What I had not been expecting to encounter the characters from those books in latter Battletech novels, but that is exactly what happened. And even with a lengthy event such as the Twilight of the Clans story arc, having different authors write different parts of the story also opened the door for their personal creations to join the story. And that is how Star Captain Horse became a part of this larger story telling of the end of Clan Smoke Jaguar at the hands of the Inner Sphere. But as Horse is of Clan Jade Falcon, how his story ends up intersecting that of Clan Smoke Jaguar does make for a rather interesting diversion from things that was pretty intense. 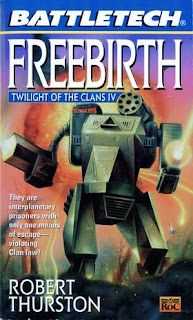 Synopsis: Battletech: Freebirth is a Battletech novel written by Robert Thurston. It is the fourth novel in the 8-book Twilight of the Clans story arc. Jade Falcon Khan Marthe Pryde has the freeborn Star Captain Horse form a Trinary of fellow Freeborn warriors to undertake a special mission directly for the Khan. This first involves visiting the Falcon Eyrie base on the Smoke Jaguar homeworld of Huntress to inspect the special research projects being undertaken there. But his true orders were to proceed on to the homeworld of all the clans. Strana Mechty for reasons to be disclosed at a later time. But when Horse and his Trinary arrive in-system they are attacked by Clan Smoke Jaguar during their decent and their DropShip is grounded on the planet. This becomes an excuse for Galaxy Commander Russou Howell of the Smoke Jaguars to claim his Trinary as prisoners and to seize their BattleMechs to augment his defenses on Huntress. Horse's only hope of freeing his men lies in the enigmatic Jade Falcon Warrior Sentania Buhallin who seems particularly skilled at getting into places Clan Smoke Jaguar would not want her to be. What I Liked: Horse is definitely one of the more interesting characters to emerge from the Jade Phoenix trilogy as he was always quite the character despite so few words. Having a book focus on him really did a lot to better flesh out the life of a freeborn warrior in Clan Jade Falcon and how he bends the rules of convention by reading books and constantly talking back in what would normally be seen as belligerent or a clear act of insubordination. But he'd always get away with it. What this book also does well is really show how different Clan Smoke Jaguar is versus other clans such as the Jade Falcons. Sure, Galaxy Commander Russou Howell isn't exactly playing with a full deck of cards in this book and is not the best example of the Smoke Jaguar warrior tradition. But the very fact that the Smoke Jaguars drew a clear line to never allow freeborn to become warriors while the Jade Falcons have certainly opens up a lot of interesting ideas that the book manages to touch on whether directly or by tangential illustration. Not all clans are alike at the end of the day. What Could Have Been Better: After the other books in the series had laid the groundwork for the big confrontation with Clan Smoke Jaguar, this side story really felt like an odd little diversion and an effort to extend the overall story arc to cover as many books as possible. I figure the narrative intent was to paint the Smoke Jaguars in a bad light but the way they ended up fluffing up this story to last a whole book just got a little bonkers. And we never really get a proper explanation for Howell's often irrational behavior. As much as there's the are the implications of being assigned to the ultimate in garrison duty and his later turn to alcohol, these don't really explain what happened to have him go totally freaky in this book. And that seems like such a lazy way of handling a character. TL;DR: Battletech: Freebirth is an odd part of this larger story arc but it does have its moments to shine. It also features those unusual Land-Air Mechs, which remain an odd consequence of Battletech involving many different franchises brought together in the beginning for the sake of art.